Well, they’re back on the snowy East Coast and regretting every minute of it. It’s 28 degrees and they have 10 inches of white on the ground. a reality check for this East Coast Family, and fellow Texans as well! 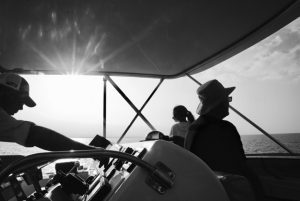 The Bolton family has fished aboard Fire Hatt with Captain Chuck Wilson for several years, nothing compares to the day they had this time…Christmas Magic? John Bolton and his son, Kyle, both from Northern Virginia, and John’s nephews Kevin and Alex Harrison from Beaumont, Texas, and Albuquerque, New Mexico, respectively, booked a half-day of family fishing in Kona Hawaii aboard Fire Hatt for the day after Christmas. We took off from Honokohau Harbor around 7:00 AM with Captain Joe Shumaker at the controls and first mate Anthony De La Cruz setting the lines. About 10 minutes out, we’re hooked up on two lines! Kyle is in the chair reeling in the larger fish, while John tries to bring in his fish from the starboard aft. Kyle’s fish makes a couple of long runs, so Anthony first helps John bring in a nice striped marlin, which we estimated at about 80 pounds. Anthony successfully tags and releases the striped marlin, then goes to help Kyle bring in and then release a blue marlin, estimated at 175 pounds. Also tagged and released. A great start to the morning only gets better. After trolling near an offshore buoy, Kevin and Alex spot whale spouts closer to shore, and Captain Joe brings Fire Hatt to a spot where we see at least four humpback whales frolicking. One of the whales puts on a spectacular breaching display. After about 30 minutes whale-watching, we’re off to do more fishing, and not long after we’re hooked up again! 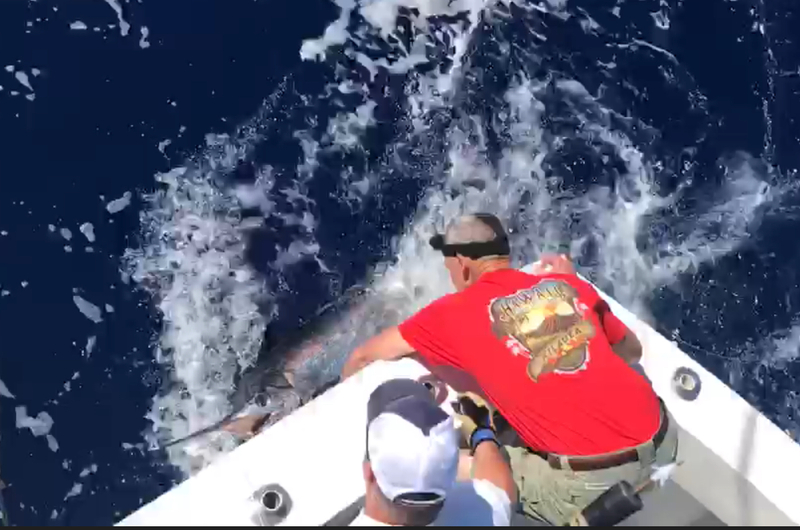 This time, Kevin is the chair, and after 15 minutes of hard reeling, he brings another blue marlin — this one estimated at 225 pounds — to the boat. Beautiful fish, as you can see from the pics. Unfortunately, we could not get a fourth fish for Alex to bring in, but Fire Hatt entered the harbor flying flags for three marlin. 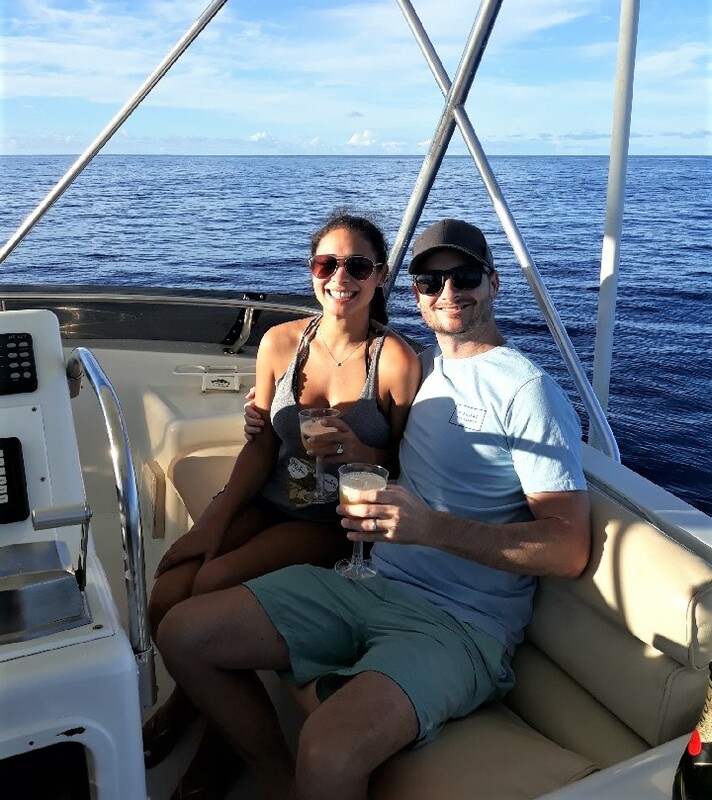 Michael and Kia Worth aboard Fire Hatt celebrating their Honeymoon. A Fleeting Marlin Moment for Michael and Kia Worth while aboard Fire Hatt this week. The Worth’s booked a 3/4 day Charter Fishing trip in Kona Hawaii with the hopes of catching a Pacific Blue Marlin. The Worth’s are celebrating their honeymoon after just getting married in Maui. Kia is from Minnesota and Michael from Australia. With busy careers, the two have enjoyed some down time in the Islands. After a quiet morning with Captain Joe Shumaker and first Mate Anthony De la Cruz, an estimated 350 pound Pacific Blue Marlin exploded on the long rigger line. While Michael jumped into to the fighting chair, the marlin jumped and ripped out line the whole time. A minute into the fight…the marlin threw the hook. Ouch! While getting out of the chair Michael made a spontaneous comment that I’m sure he will be reminded of for years to come… “That was the most exciting minute of my life!” Kia will surely grin every time this story is told. Six Species in Two Days for Joe Gunja aboard Fire Hatt. Now and then a person enters your life and it is almost as if they were sent for a reason. Joe Gunja called me and we discussed a two day fishing Charter on FIRE HATT, fishing for Blue Marlin in Kona Hawaii in November 2017. A little history on our adventure, Joe is from Springfield Missouri. I was born in Harrisonville about 90 miles away about the same time. Joe is a retired high ranking Federal Bureau of Prisons Regional Supervisor, effectively making him the second in Command, supervising over 20 Wardens. Myself as a retired Chief Officer in the Fire Department we both had a lot of stories to share on our Public Service times and experiences. Joe had fished many of the Lakes and rivers I had as a youth and he updated me on the new (40 year old) Harry S. Truman Dam and Reservoir that is in the middle of the Southern Missouri Fishing and Hunting Region. Joe’s wife passed away suddenly this past year with no previous illnesses and he himself had suffered Leukemia and is now in remission. Joe is a former Army Military Policemen and then rose through the ranks of the Federal Prison System including being the Warden at three prisons. While a disciplined and structured Man, Joe has a love for adventure and fishing. Joe, my backup Captain Joe Schumaker and I set out and started combing the waters off Kona Hawaii and shortly later caught a 40 pound Shortbilled Spearfish, a rare species World Wide and only found in the waters of the Central Pacific. 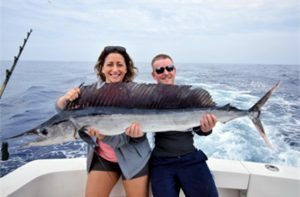 Many Anglers throughout the World come to Kona to try to capture this rarest of Billfish as they had caught most of the other Billfish Species that lived in their Ocean waters. This turned out to be just openers as over the next two days Joe caught six different species of Gamefish that reside here in Kona Hawaii. Finishing off our first day adventure was a 20 pound Skip Jack and later a 15 pound Barracuda. Day two began with an early morning bite with the first species being an Ono, also called “Wahoo”, followed by a small Mahi Mahi and then came the Big Pacific Blue Marlin. Estimated at 300 pounds while being released, it was by far Joe’s biggest fish of his life, so far. Attached are some glimpses of the Blue Marlin as we hooked up brought it to the FIRE HATT. Joe Gunja and I have become solid friends and we will share many more of these adventures as time goes by. 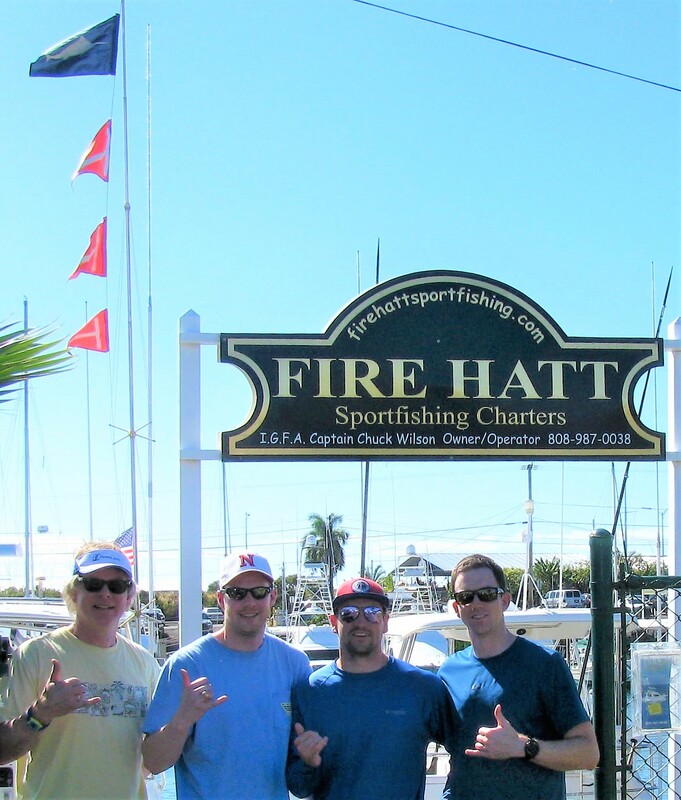 Thanks Joe for coming out to fish FIRE HATT in Kona Hawaii! Beautiful Morning Sunrise aboard Fire Hatt with the Kelln and Dwyer Families, Waiting for the Mahi Mahi bite! From Two Pound Bass to 200 Pound Blue Marlin. Today on Fire Hatt, Daniel Perez broke his personal all time record for the largest fish he has ever caught, (a two pound Bass). This estimated 200 pound Pacific Blue Marlin will give him bragging rights for a very long time. Daniel brought the beauty to the boat in just under 20 minutes. The Marlin was tagged and released, tired but unharmed by Captain Joe Shumaker. Nice! Daniel is from the Bay Area of Northern California. Fire Hatt was in about 1200 fathoms just outside the Honokohau Harbor Marina when the fish exploded on the short bait. Captain Joe Shumaker likes to run the well known “Smash Bait” in tight close to the boat…for this reason! The Big Blue jumped at least fifty times and tired itself out giving Daniel the upper hand. Scientific name: Makaira nigricans. The blue marlin is the largest of the marlins, common to 11 feet, and known to exceed 2,000 pounds. It is cobalt blue on top shading to silvery white on bottom, although colors can vary by region. In common with striped marlin, they are rarely encountered in shallow nearshore waters, preferring blue, oceanic waters. Tag and recapture data show that blue marlin travel long distances and routinely make trans-Pacific or trans-Atlantic crossings. One recent tag return indicates the first inter-ocean for a blue marlin that earlier data on genetics suggested occurred). In the Pacific, blue marlin tagged in Kona, Hawaii have been recaptured in the South China Sea, in the Marquesas, and off the western coast of South America Some of these movements have occurred in relatively short time scales. In August of 1997 a pilot project was undertaken on blue marlin in Pacific waters off the coast of Kona, Hawaii. In this project the first generation pop-up satellite tags were set for durations of 60-90 days and fish ranged in body size between 130 and 300 lbs. Three of the tags successfully surfaced and transmitted data, and one fish was caught within a week after release within a mile of the initial tag and release event. Remarkably, one blue marlin traveled from Hawaii to an area west of the Galapagos (a distance of approximately 3000 nm) in 90 days. At the time people doubted a marlin from Hawaii could travel this far. The remaining five tagged blue marlin did not report back for unknown reasons, possibly tag failure due to antenna interaction with the fish or mortality. The tagging data provided a short term view that was consistent with the acoustic tagging data- marlin were primarily fish of the surface 50m but occasionally dove to deeper depths. A break from Alaska finds this charming couple their largest fish ever! James and Monica Lavell were on a delayed Honeymoon here in Kona Hawaii. It was their first trip to the Islands. The couple live in Eagle River, AK where James is a Operating Room Nurse and Monica is an ICU Nurse. 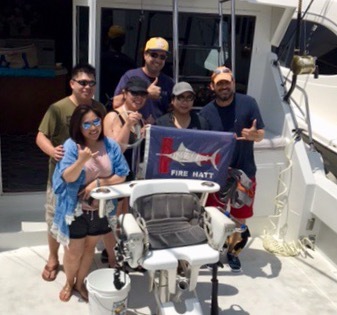 While charter fishing in Kona Hawaii aboard Fire Hatt, they were hoping to catch anything! That anything turned out to be a nice 40 pound Short Bill Spearfish! James said “It all happened so fast!” Captains Joe Schumaker and Brian Schumaker had James swiftly in the chair and fighting the fish in a matter of seconds. With Monica cheering him on, he brought the Spearfish to the boat in just under 15 minutes. 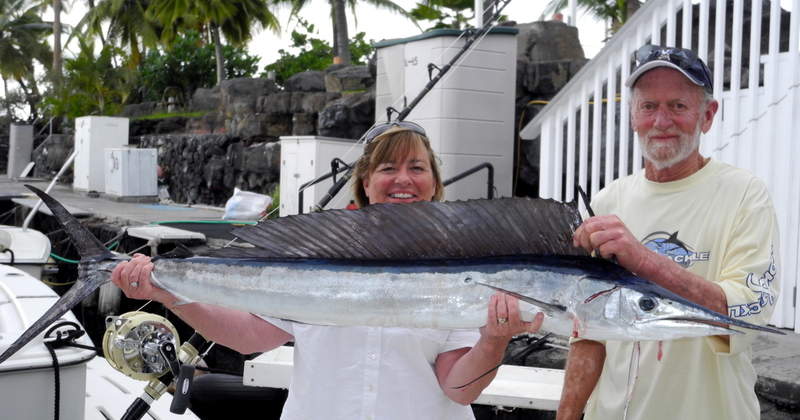 Fishing in Kona Hawaii was sure to hold a lot memories for this couple. Hope to see them again on another break from Alaska and have Monica get her biggest fish too! Hebi has white to pink colored flesh that is somewhat softer than that of Nairagi or Kajiki. Its flavor is mild (although more pronounced than ahi). It is one of several species of billfish, which are suitable for grilled or broiled “catch of the day” menu items in restaurants.